A 'Convenient Action' Response to The Inconvenient Truth? A ‘Convenient Action’ Response to The Inconvenient Truth? Development for all: The Bus Rapid Transit (BRT) System in Ahmedabad, Gujarat is unlike Delhi and works. While the difference in population of the two cities ensures there can be no comparison, the implementation success of ‘Janmarg: the People’s Way’ as it is called in Ahmedabad is indeed praiseworthy. 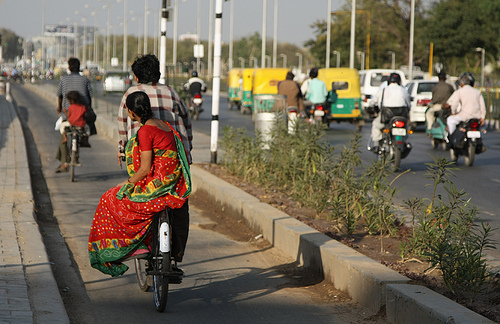 India is serious when it comes to taking action for combating climate change. And if Environment Minister’s change of India’s two decade long stand in international negotiations (backed later by the Indian Prime Minister) to ensure a fair deal isn’t proof enough, Chief Minister of Gujarat Shri Narendra Modi now pens a book titled Convenient Actions – Gujarat’s response to challenges of climate change. “At the outset I am happy in reporting to this August forum that despite severe earthquake, recurrent floods, and a near collapse of urban cooperative banking system, Gujarat has been able to keep its (growth) promise to the nation.”, is how Mr. Modi had begun his speech at the 52nd meeting of National Development Council in December, 2006 in New Delhi. Four years down the line, the determination of Gujarat state and its leadership in paving the way towards sustainable growth seems closer today, with the release of such a published work. The book, published by MacMillan Publishers India, consists of 250 pages which mainly talk about the steps taken by the Gujarat Government for Environment protection. The book showcases projects like the River Basin links, water treatment plants and the BRTS Corridor in Ahmedabad. Gujarat, with various measures, is moving towards the low carbon economy. Mr. Steve Howard, CEO, The Climate Group, London, described the book as ‘Green Autobiography’ of Narendra Modi and said that Gujarat model will show direction to others in policy making on the issues like climate change. PrevDelhi Greens Blog Wishes Merry Christmas to All its Readers!